Faith. Family. Ducks—in that order. 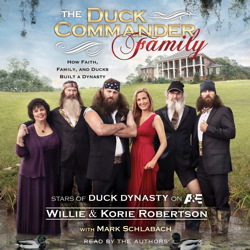 This audiobook gives readers an up-close and personal, behind-the-scenes look at the family in the exploding A&E® show—Duck Dynasty®. This Louisiana bayou family operates Duck Commander, a booming family business that has made them millions. You’ll hear all about the Robertson clan from Willie and what it was like growing up in the Robertson household. You’ll sample some of Willie’s favorite family recipes from Phil, Kay, and even some of his own concoctions; and you’ll get to know the beautiful Robertson women. You’ll hear from Korie about the joys and hardships of raising a family, running a business, and wrangling the Robertson men while staying fashionable and beautiful inside and out. Discover more about the family dynamics between brothers Willie, Jase, Jep, and parents Phil and Kay. You’ll even meet a fourth brother who isn’t in the show. The popularity of Duck Dynasty is skyrocketing, garnering a Wednesday-night top two finish in all of cable. Really enjoyed this audiobook. Professional voice actors and improved editing would make it better.